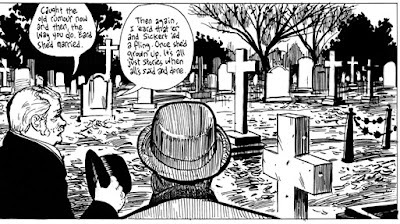 Eddie Campbell: Alan Moore's London. postscript. I do believe I've squeezed all I can from the FROM HELL photo refs. There is still a bundle of them (though none in which Alan appears), but there's little else I can say to make them more than anybody's commonplace snaps of London town. One little observation I might add that may be of help to young artists: the real value in using photo reference is that it allows us to capture particularity. 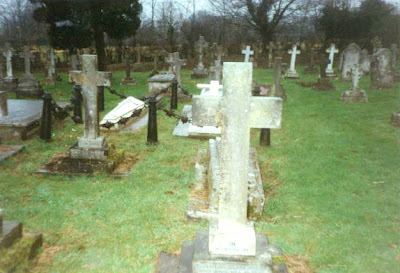 Compare the Bournemouth cemetery with the one at Bunhill Fields which I showed in part 1 on on 21 dec. In this one notice the preponderance of cross-shaped stones, compared with the flat stones of the earlier cemetery, (punctuated with an occasional obelisk). Let's presume that every cemetery has its own thumbprint. And it would be unwise to assume that a London shop front is much like one from any other city. 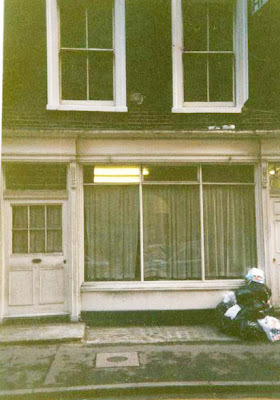 Thus I engaged my pal Ed Hillyer, who was working on the Eyeball kid with me at the time, to shoot a roll of film in and around Cleveland Street for chapters 1 and 13 (Ed lives in London and Alan doesn't). For Snakes and ladders Glenn Dakin was able to do the honours and shoot a roll in and around Red Lion Square. You won't find the exact images you're going to need on the internet. Still on the From Hell theme, I've been eyeing that pile of script in the box over there. It was annoying me being all out of order after dropping it a few days ago and so I organized it. It may be interesting to copy out one or two of my favorite pages of Alan"s script and show that under the relevant page as printed in the book. Yes please to some more script pages that haven't already been published. Any good ones where you didn't follow Alan's instructions but found a better way of doing it? You got Ed to take photos for you?! The last time I asked him to take one he looked at the camera as if it were alien technology then fretted and flapped his arms about for a bit before finally taking a picture in which I looked like a rasher of streaky bacon. Eddie, your point about photo references helping the artist determine the uniqueness of a setting, rather than forcing them into a slavish recreation of what's in the picture, is great advice that I'm thinkin' some artists would benefit from! 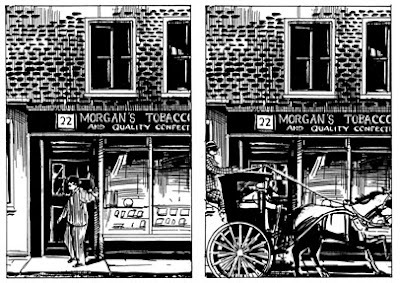 Certainly one of the comments I always hear from folks I lend From Hell out to, including some who don't normally read comics, is how amazingly the feel of London in the late 19th century is evoked. The immersion quality of Alan's script and your dead-on artwork speaks as much to the enduring appeal of the series as any fascination with Ripper-lore, in my opinion. And probably that's at least one reason why the movie didn't succeed in the same way (I'm sure you have a list of other reasons...). Actually I'd have to say that the production designe was one of the ways the film DID succeed in the same way- we modeled everything aftrer Eddie's brilliant drawings. I really think FROM HELL should be done Sin City style using your drawings as a ten hour HBO miniseries. How cool! well I'd be up for it. Not sure how we'd get around Alan. Fortunately I think Fox owns the rights already. In fact I'm sure of it. They'd have to pay you all again, but that's cool. No need to get around Alan he's too busy blocking the doorway himself.